Just returned from a visit to lovely Coral Springs on the east coast of Florida where my brother and his family live. 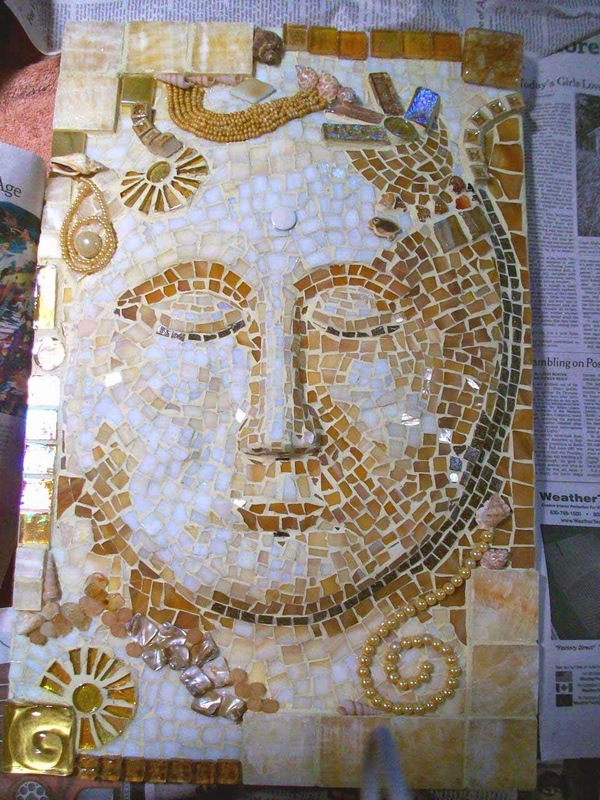 I needed to deliver a mosaic face they had commissioned for their master bath and also to mosaic parts of a couple of wall fountains. I was also due to see my neurosurgeon in Miami for annual check-up (which, by the way, was fine! ), so combined busiiness with pleasure. To top it all off, it turned out that I had seredipitously chosen the very weekend that my neice and her boyfriend were going to be in town, so we had a chance to reconnect. The bath face will be bordered by a pencil tile border in the same honey onyx that comprises the counters and the sink vessel and shower accents in the bathroom. I also used a few 2x2 pieces around the edge of the face. I don't have a final photo because it hadn't been installed by the time I left; I'll add one here later, but this photo gives you a preview. The fountains presented different problems! As I tell my classes (and I'm sure they are tired of hearing): a mosaic project is a series of solving problems. The "fish" fountain has four intricate sections that were to be tiled, and I thought I would first make paper templates and then transfer that to mesh. Well, my template-making skills turned out to be %$%^&* - (you get the idea). Rather than start over trying to make better templates, I just used what I had - partial mesh pieces - and filled in the rest by hand, standing up, in the heat, for what seemed like days. John took pity on me and found a fan. I did manage to make good templates for the small sections underneath on either side, so those went faster. I was using thinset as my adhesive, as the fountain has a rough texture. This worked fine for the larger mesh sections, but for smaller glass pieces I ended up using the silicone glue. 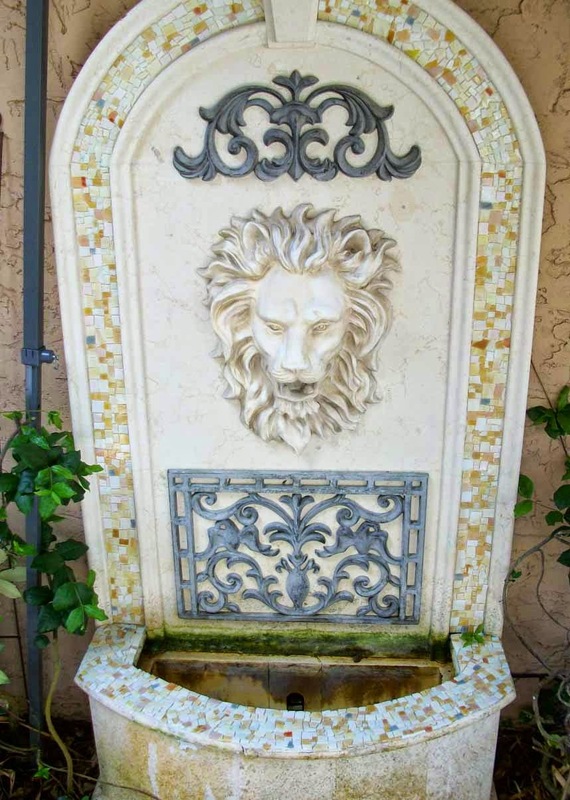 The larger fountain with the lion face was a bit easier. I had the width and length of the side borders beforehand and was able to make finished mesh strips of glass before leaving Sarasota. This fountain is made of resin, so instead of thinset, I just used Liquid Nails to adhere the strips - much faster and less messy! The tricky bit for this fountain was stabilizing the front shelf; it had broken in a few places previously, so we found a few old tiles to glue down underneath it and mortared them in place; then I made a template for that front shelf and made a mesh strip to adhere to it. 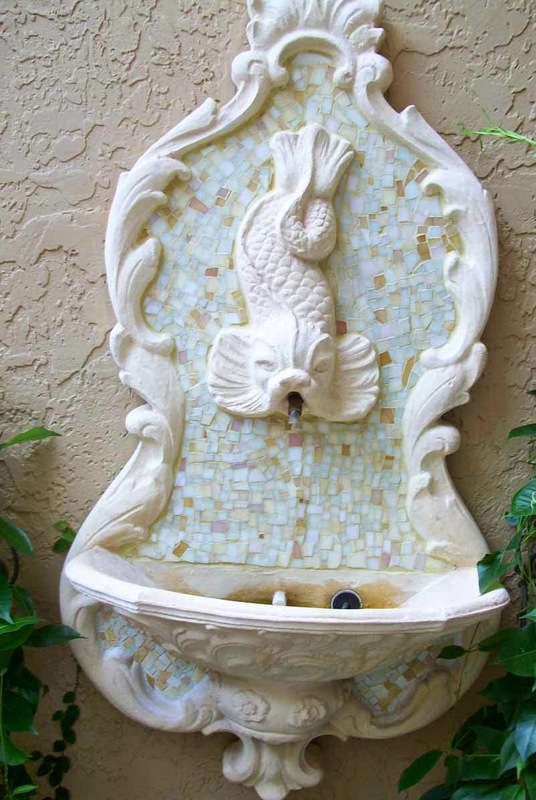 The grout pulls everything together on both fountains, and the grout color turned out to be almost exactly the color of the fountains themselves (a good thing for clean-up!). Since I had a lot of work to do on the mesh before actually working on the fountains themselves, John set up a little "studio" for me in the (air-conditioned!) garage where he usually keeps his Z car - now that's love. 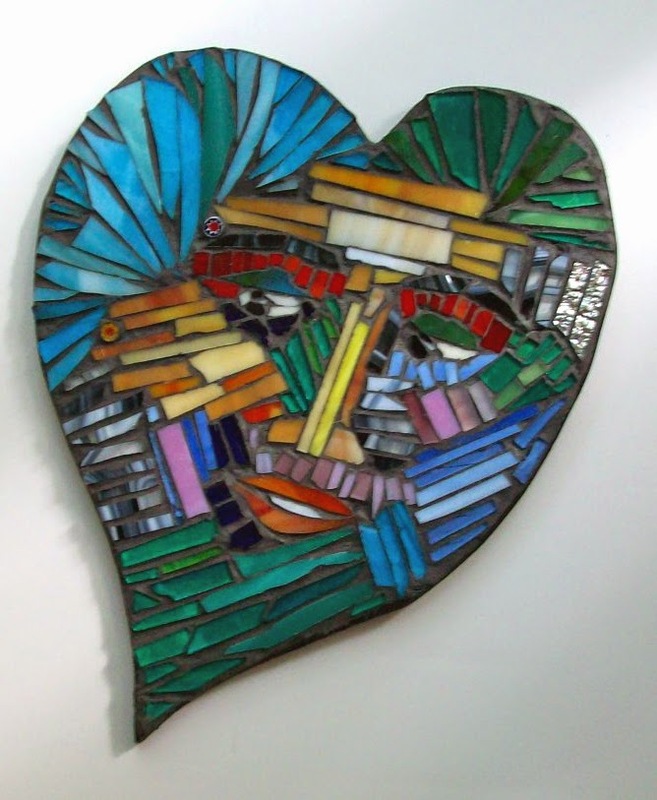 At Sarasota County Technical Institute, where I teach a class in mosaic, I share a classroom with stained glass classes (among several others), and a while ago I asked the stained glass teacher to save all the beautiful glass scraps that I was seeing in the trash can. I thought I had such a brilliant idea -- you know, save the planet, reuse, recycle, and so forth and so on. Well, very soon I began to feel like Mickey in "The Sorcerer's Apprentice," because the bin of designated glass scraps began to fill up higher, and higher, and higher -- then there was a break of a couple of weeks between the end of one of my sessions and the beginning of a new one, but meanwhile the stained glass classes had NOT ended yet, so when I came back to the room the bin was overflowing! Quickly I found a second bin and decided I HAD TO DO SOMETHING. So first I set myself a challenge. I separated out a bunch of straight pieces that had been tickling at my consciousness anyway because they were so perfectly straight, and I thought it would be fun to see if I could make something NOT straight with them. And since I've been doing a lot of faces lately, I decided to make a face using only -- or mostly -- straight pieces from the scrap pile. This is the result. I liked it so much that I decided to put the scrap challenge to my students, since we're coming up to a 6-week break between sessions. 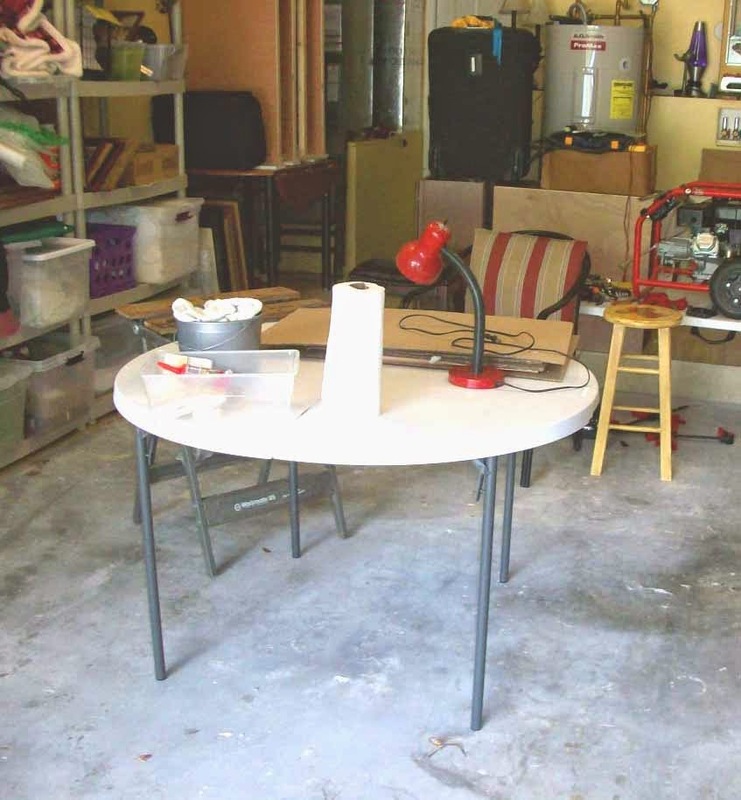 Their challenge is to take home as many scrap pieces as they wish, and to make whatever they'd like before class starts again at the end of September. It doesn't have to be a face or anything realistic. It could be a color study, or a shape study (we've been discussing ideas, since Tuesday is our last class). The challenge is optional, but I expect great things! And I'll post any results! At least it will lower the level of that scrap pile.